The ESRF Council, representing the 22 partner nations of the ESRF, gave the green light for the construction and commissioning of four new beamlines from 2018-2022. 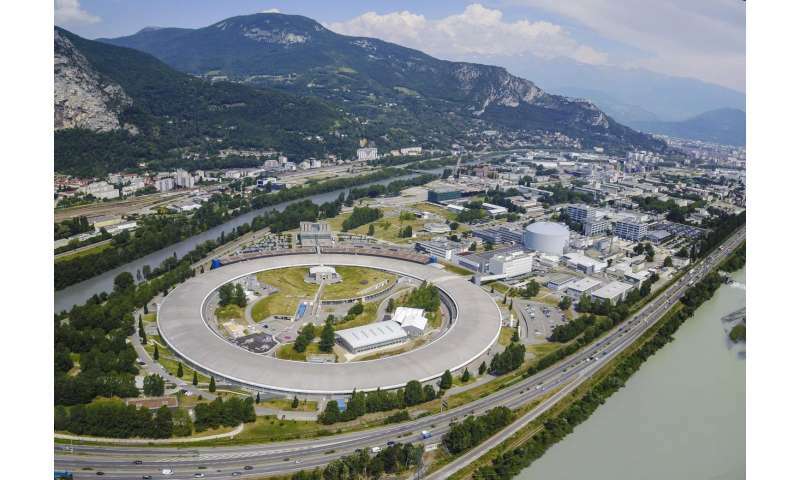 The beamlines are designed to exploit the enhanced performance of the first of a new generation of synchrotron, the Extremely Brilliant source (EBS), which is being built at the ESRF. The four new beamlines will underpin research addressing the major challenges facing our society, including defining the next generation of biomaterials and new sustainable materials, developing new drugs, unravelling the complex mechanisms of living organisms and reconstructing historical artefacts and fossils in 3D, which will open new windows into the origins of humanity. Serial crystallography is emerging as a unique technique to solve structures of important classes of proteins available only in sub-micron crystals, whilst managing radiation damage. This EBS beamline will provide new perspectives for life sciences by providing a unique facility worldwide for its flux-density and stability. Examples of research applications: fundamental problems such as enzyme kinetics; drug effects into target proteins; determinants neutralizing human antibodies against viruses. Dark-field hard X-ray microscopy is unique to study the hierarchical correlations of structures in materials from the millimetre range down to tens of nanometres. This beamline will provide new perspectives for a deeper understanding of material properties in nano-structured and non-homogeneous materials by providing a unique facility worldwide for its hard X-ray penetration, flux-density and stability. Examples of research applications: multi-scale characterization of modern engineered materials; biomaterials like artificial hips, implants; effects of environmental agents; material fatigue in transportation. Coherent X-rays are ideal to study the secret correlations in materials and living matter in 3D-space and in time under operando conditions. This beamline will provide new perspectives to observe dynamic processes under real conditions and detect characteristic correlations determining reversible and reversible processes down to the single atom by exploiting the EBS unrivalled X-ray coherent flux.Examples of research applications: dynamics and structure of muscle deformation; understanding fundamentals of heart diseases; biomineralisation processes in teeth (dentin); image formation in photonic devices (smartphone panels). With very high energy and X-ray coherence, high throughput tomography is ideally suited to study large objects (~1 metre) with a sub-micrometre resolution in a non-destructive way. This beamline will provide new perspectives for research in palaeontology and archaeology, but also for the industrial study of materials by providing the largest high-energy and high-coherence synchrotron beam worldwide for hierarchical imaging and high throughput tomography.Examples of 3D-imaging research applications: materials for space, aeronautics, automotive; micron-scale anatomy of complete organs; hierarchical imaging of large specimens (e.g. mummies); 3D-virtual reconstruction of fossils and unique artefacts. In May 2015, the ESRF launched the ESRF-EBS project, an investment of 150M€ over 2015-2022. The EBS is a new and revolutionary X-ray source, based on a novel concept of storage ring. This is the first of a new generation of synchrotrons, the design of which has been adopted by essentially all future synchrotron laboratories worldwide. The EBS is also an innovative scientific project, with an ambitious instrumentation programme, an intensified 'big data' strategy, and the construction of new state-of-the-art beamlines, designed to exploit the enhanced brilliance, coherence flux and performance of the EBS source. This decision to build the four beamlines represents a decisive milestone for the ESRF-EBS project. While other fourth-generation upgrade projects around the world are still in the conceptual phase, the EBS is off the blocks and drawing new perspectives for X-ray science with an ambitious portfolio of beamlines. "The new storage ring, together with the most advanced portfolio of new beamlines, will enable scientists to bring X-ray science into research domains and applications that could not have been imagined a few years ago. EBS will provide new tools for the investigation of materials and living matter from the macroscopic world down to the nanometre scale and even down to the single atom. Opening new possibilities for synchrotron science is at the heart of the ESRF's mission", underlines Dr Francesco Sette, ESRF Director General. The decision taken by the Council results from a process that has strongly involved the international scientific community. In 2015, the ESRF launched a call for Expressions of Interest (Eol) to identify the most impactful and scientifically promising projects that the ESRF can realise with the EBS source. The ESRF Scientific Advisory Committee selected eight projects among the 48 Eol received. "Since constructing and successfully commissioning the first third-generation synchrotron in the 1988-94 period, ESRF has invented a new model of cooperation among synchrotron scientists and engineers: sharing expertise and resources among partner countries to get the best minds, boost international collaboration and deliver the best science. Today, the ESRF continues to play this pioneer role with the EBS project as demonstrated by new partner countries accessing the ESRF and by the huge engagement of the X-ray scientific community in defining the future EBS scientific programme and beamlines", says Dr Francesco Sette.